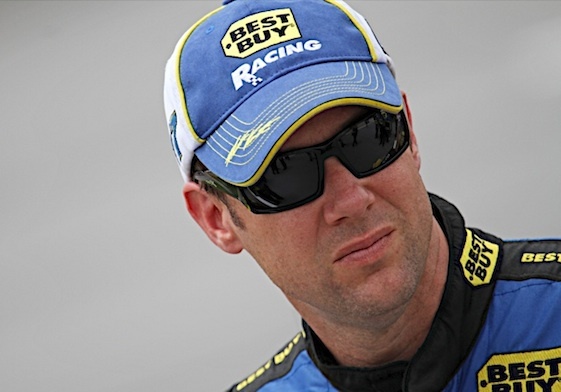 KANSAS CITY, Kan. – Sprint Cup’s hottest feud is over after all of three days as both Matt Kenseth and Tony Stewart said Tuesday that it’s time to get back to racing for the 2012 series championship. Kenseth said it after a tire test at Kansas Speedway on Tuesday afternoon and in doing so, echoed what Stewart told reporters during a sponsor appearance at Charlotte Motor Speedway earlier in the day. “Tony and I have raced together for a really long time,” Kenseth said. “We’ve rode motorcycles together, we’ve raced sprint cars together, late-models together…you’re always going to have problems with people here or there. Most of the time it’s not one person’s fault. People don’t always see things the same way. On Sunday, Stewart did not look or sound like he would get much anything worked out. In the race at Bristol, he and Kenseth tangled on the track. It led to a wreck that took Stewart out of the race. After the wreck, Kenseth pitted for repairs and on his way out of the pits, Stewart was waiting for him. Standing near the pit exit, Stewart threw his helmet at the Roush Fenway Racing driver’s car. The helmet hit Kenseth’s Ford squarely in the front grill. On Tuesday in Charlotte, Stewart backed completely off of the threat. The former champion added that he was mad after the race – but not strictly at Stewart. Kenseth is second in points and is locked into the Chase. Stewart is ninth in points and just 34 ahead of 11th-place Kasey Kahne. But, Stewart has three victories. 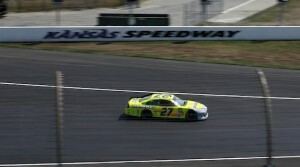 Kenseth was among eight drivers at the Kansas test, which will continue on Wednesday. The verdict on the new track was: too early to tell. Kenseth, who holds the track record of 180.856 mph set back in 2005, expects a new track record this fall. The surface was tricky in the morning, drivers said, but in the afternoon, the new asphalt began to rubber-up, and it began to come around. The old surface, which was in place when the track opened in 2001, had began to come up. Drivers initially balked at repaving Kansas as it had gotten very racy over the years. Earnhardt said the changes were evident in Turns 1 and 2, but the other two turns appeared to be the same. Earnhardt also said the entrance to pit road has become more challenging because of the way the banking meets the apron of the track. Other drivers who are taking part in the two-day tire test, which wraps up Wednesday, include Mark Martin, Joey Logano, Paul Menard and Juan Pablo Montoya.